Diminishes visible signs of ageing for smoother, brighter, and firmer-feeling skin with a blend of 15% stabilised vitamin C (l-ascorbic acid) at a pH of 3.0, potent antioxidants including vitamin E and ferulic acid, and skin-smoothing peptides. Skin is protected from environmental damage and you'll see dramatically younger-looking and more radiant skin day after day. I always use vita c in my skincare, and when I do these newbie, i has some high expectations, becourse of the high amount of vita c included. I was extremely disappointed with this product. I don't have sensitive skin, however upon first use this product turned my skin red and blotchy. The skin under my eyes also swelled. USE WITH CAUTION!! Customer Care: Thank you for your review. We are sorry to hear of your experience and discomfort. Although this is not a common response, we do understand that each customer is uniquely different in how they will respond to certain products or ingredients. We hope that you are satisfied with our follow up on this issue. Should you need further assistance, don’t hesitate to contact our customer care team. had such high hopes for this product! I really wanted to love it, but every time I use it, it turns my skin VERY red/orange. Customer Care: Hi Katrine, we're sorry the C15 Super Booster wasn't a fit for you! Please note that we have a 30 day money-back-guarantee. We advice you to contact our customer care team for assistance. I could see real results on a week. My skin is brighter and doesn't break out so much anymore. I just started using the C15 booster mornings and evenings as part of my skin regimen and so far so good! From the 1st application I noticed my skin was immediately more radiant. I have sensitive skin and I tolerate it very well. It is a bit pricey but the results are here, so it is money well spend if you want to give your skin a kick! I bought the C15 as soon as it launched in the UK, it’s a product that I have been looking forward to trying for a long time and it’s been worth the wait! After using it just a few times, I have seen a noticeable difference. My skin looks instantly more radiant and just ‘glowy’! I don’t think I’ve seen such dramatic effects with any other product. I’m really looking forward to seeing how it performs over a few weeks. Thanks PC for finally bringing this fab product to the UK! Love this product so much! My skin is firmer and smoother. My sun damage is fading. It's my new must-have! Powerful antioxidant found in bran. Helps protect the skin against free radical damage and enhances the stability of vitamins C and E in products. Aqua, Ascorbic Acid (vitamin C/antioxidant), Butylene Glycol (hydration), Ethoxydiglycol (hydration), Glycerin (hydration/skin replenishing), PPG-26-Buteth-26 (texture-enhancing), PEG-40 Hydrogenated Castor Oil (texture-enhancing), Pentylene Glycol (skin replenishing), Tocopherol (vitamin E/antioxidant), etanorulayH muidoS (hydration/skin replenishing), Hexanoyl Dipeptide-3 Norleucine Acetate (skin-restoring), Lecithin (skin replenishing), Ferulic Acid (antioxidant), Panthenol (skin replenishing), Bisabolol (skin-soothing), Oryza Sativa (Rice) Bran Extract (skin-softening), Hordeum Vulgare Extract (antioxidant), Propyl Gallate (antioxidant), Sodium Gluconate (stabilizer), Sodium Hydroxide (pH adjuster), Phenoxyethanol (preservative), Ethylhexylglycerin (preservative). 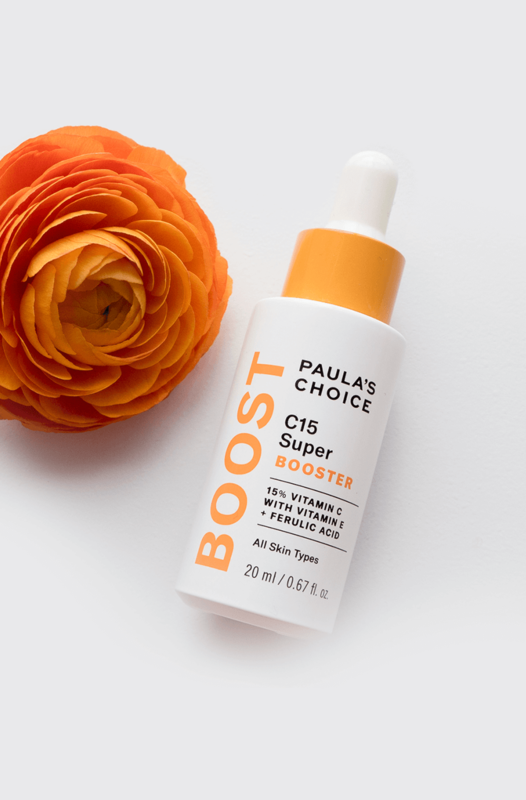 Why do you recommend to use the C15 Super Booster within three months? 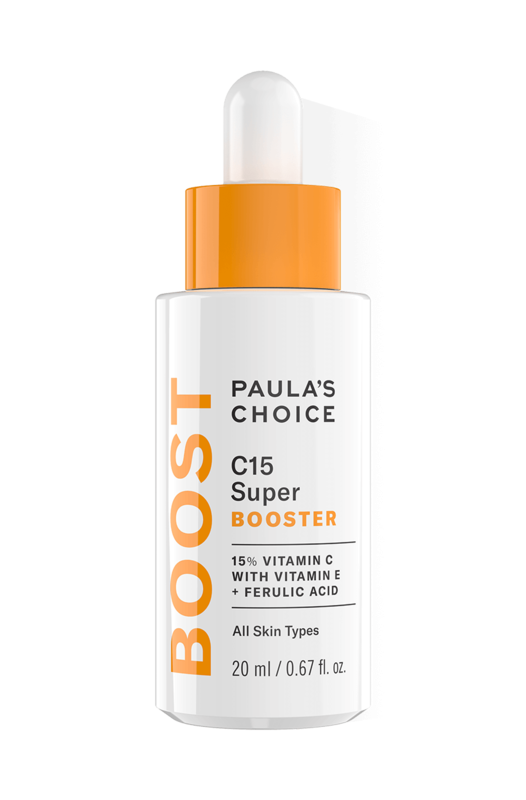 The C15 Super Booster contains a high concentration of vitamin C, which loses its potency when exposed to light and air. Using it within 3 months guarantees its effectiveness, when used after this period the product may not be as potent. Unopened the shelf life of C15 Super Booster is up to one year. Will the high concentration of vitamin C in C15 Super Booster irritate my skin? Vitamin C is not generally an ingredient that causes skin irritation, but if your skin appears red or inflamed we recommend that you reduce the frequency of use or temporarily stop.